The world governing body of football, FIFA, wants VFF to sign a partnership agreement with Vanuatu government. 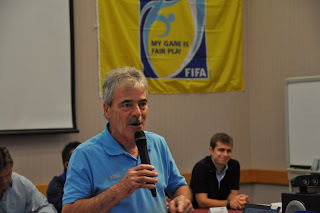 The announcment was made by FIFA development officer to the Oceania region, Mr. Glen Turner during a meeting last week with the Vanuatu Sports Minister, Honourable Raphael Worwor in Auckland. Minister Worwor, in his statement, he emphasised Vanuatu Government's continous support to football development in the country and said they will ensure such links are created to continue develop football in the country. The partnership agreement will allow VFF to manage some facilties like PVM Stadium in Port Vila and Chapuis Stadium in Luganville, Santo. This year, FIFA committed 40 million vatu grant towards Vanuatu Football Federation, to carryout its programme.